Scheid Family Wines Announces Mission, Vision and Values. Bringing people together to enjoy and savor life. By 2025, Scheid Family Wines will become one of the most recognized wine producers in quality, innovation and sustainability in the world. Scheid Family Wines (SFW) announced it has promoted Dave Nagengast to Vice President of Winemaking. Dave has served as the company’s Director of Winemaking since 2006. Among other duties, Dave will direct the winemaking for all SFW’s individual wineries and brands including Scheid Vineyards, Metz Road, District 7, Stokes’ Ghost, VDR, Ranch 32, Ryder Estate and GIFFT. Dave is an early adopter of sustainable farming and winemaking practices, and an innovator in both the vineyard and cellar. In 2017, he and his team developed their In-Vineyard Native Yeast Fermentation Program to create the ultimate expression of Chardonnay from the Riverview Vineyard. To avoid the influence of yeast strains already established at the winery, they brought a small press and refrigerated container to the site to initiate a true Riverview indigenous yeast fermentation. They crushed the grapes and filled twenty new French oak barrels, half of Wente clone and half of Dijon clone 96. The resulting wine beautifully captured the true personality of this unique cold-climate site. Dave holds a B.S. 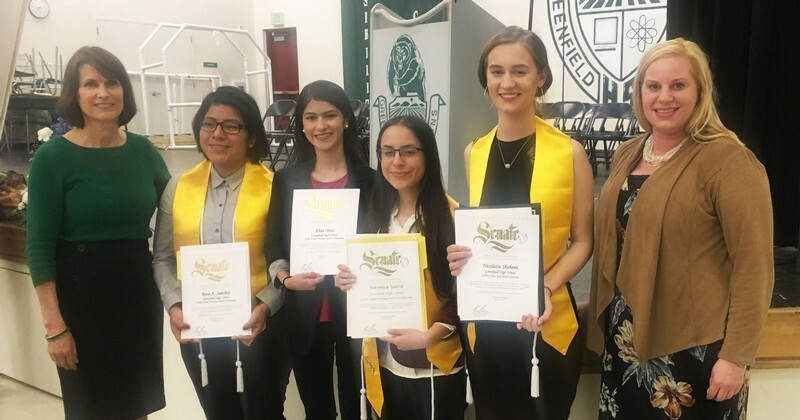 degree in Agriculture Science with an emphasis in Enology from California State University at Fresno. He joined SFW in 2002 as a consulting winemaker. Prior to that, he held winemaking positions at Storrs Winery, Mirassou Vineyards and San Martin Winery. Dave and his wife Beth have three sons who have followed in his footsteps as a collegiate discus thrower. "Expanding the diversity of varieties is key to what makes Scheid a standout in the industry." More at Coastal Grower (pages 40-41). 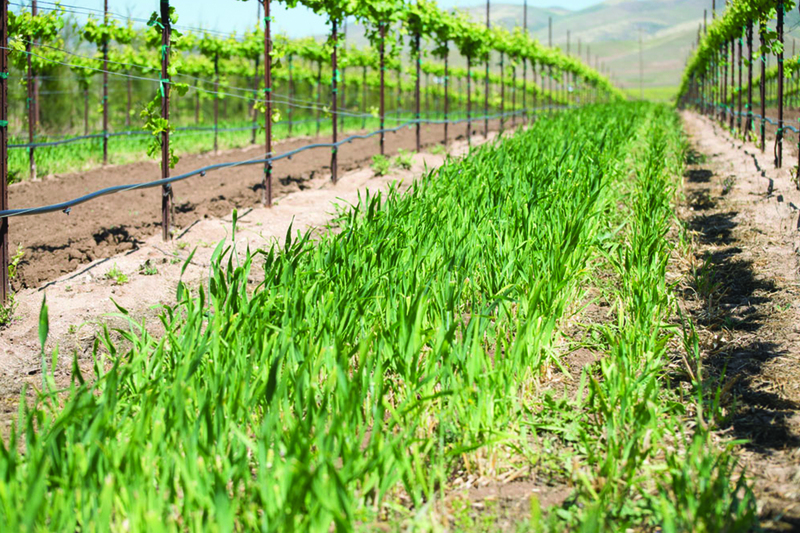 A recent article features Scheid Family Wines as an early adopter of new vineyard technologies. More at WineMag.com. 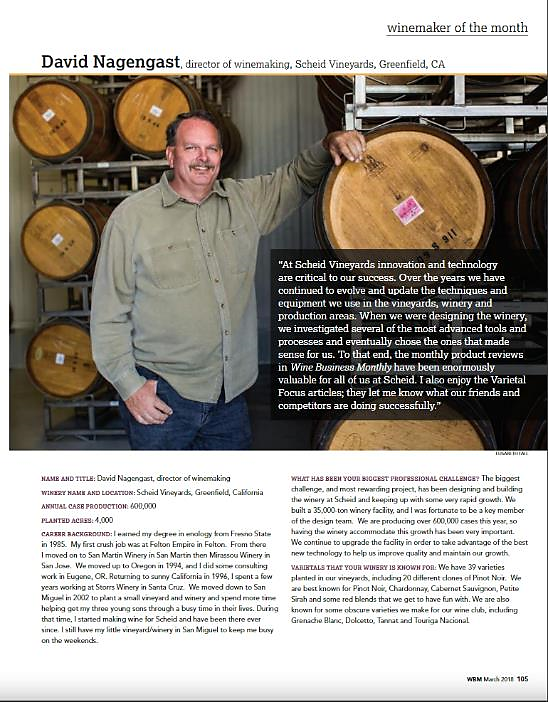 Congratulations to our Director of Winemaking, Dave Nagengast, for being selected as Winemaker of the Month in the March 2018 issue of Wine Business Monthly! Read more at Wine Business Monthly. Scheid Family Wines is pleased to announce Young’s Market Company will manage distribution of its wines throughout California. Effective immediately, Young’s will sell Scheid’s full portfolio of wines, including: Scheid Vineyards, District 7, Metz Road, Ranch 32, VDR, Stokes’ Ghost, GIFFT, Ryder Estate, and other exceptional Monterey County wines. Scheid Family Wines was founded in 1972 when Al Scheid planted his first vineyards in Monterey County. 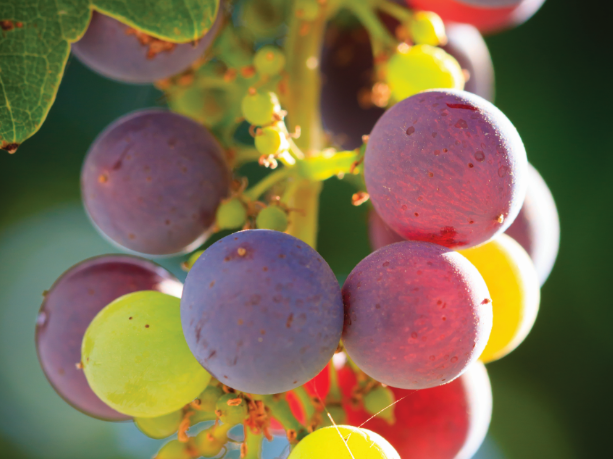 Today, the grapes-to-glass family business owns 11 estate vineyards along a 70-mile stretch of the Salinas Valley. In 2005, the Scheid family built a state-of-the-art winery with a crush capacity of 30,000 tons. The company also built a small Reserve Winery where their luxury-class, limited-production wines are produced. With 4,000 acres of vineyards planted to 39 varieties including 20 distinct clones of Pinot Noir, Scheid Family Wines is positioned to quickly respond to consumer preferences and market demands. With today’s announcement, Young’s Market Company now represents Scheid Family Wines in California, Oregon, Washington, Montana, Idaho, Hawaii and Alaska. The Tasting Panel featured Scheid Family Wines in their December 2017 cover story: Ingenious Geneaology: The Scheid Family, Their Extensive Monterey Vineyards and Powerful Innovative Winery! Read more at The Tasting Panel.